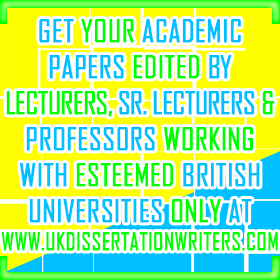 All dissertations/coursework/assignments are written and edited by Lecturers, Senior Lecturers & Professors working with elite universities in the UK. Most of their writers don’t even know how to write correct English. Our respected academic writers (i.e. Lecturers, Senior Lecturers & Professors) always deliver non-plagiarised papers in flawless English. They just make false promises for providing non-plagiarised work and their writers always engage in “copying & pasting”, thereby delivering highly plagiarised pieces of writing. The drafts delivered by our respected writers always excel in quality. With them, expect false promises and poor quality of work. Deadlines are agreed upon before accepting the work, and all academic papers are delivered in accordance with the agreed deadlines. Deadlines are agreed upon, but you can never be sure of whether those deadlines would be adhered to or not. No false promises, nonsense show-offs/claims. Lots of false promises, various show-offs & guarantees. Giving guarantees don’t cost them a penny. When the time of actual fulfillment comes, they make different excuses, thereby putting your grades to risk. No cheap service is provided by us. Our writers charge expensive rates for the hard work and time they invest in delivering the best quality assignments/course-work/dissertations/thesis to the students. Though our rates are highly expensive, our clients love us for the quality of work delivered by our respected academic writers i.e. Lecturers, Senior Lecturers & Professors You can find very cheap writers on other websites as their writers don’t have any standards. No qualification, no command over English language, no originality in writing and no respect for deadlines – these are the most common traits found in the writers of other websites. We maintain confidentiality at its best. We never ask for the telephone number or other personal details from students. We don’t give an option for telephonic communication so as to leave no scope for revelation of any student’s identity. The only mode of communication between the students and UK DISSERTATION WRITERS is ‘EMAIL’ communication. They provide helpline numbers for showing that they provide 24/7 customer support to their clients. This doesn’t provide any real benefit to the students. Rather, it paves way for revelation of the personal details of the students. They never provide any genuine solutions on telephone once they get the advance payment from a student. No confidentiality is maintained, and sometimes they misuse the personal details of the students for extorting money from them. With our services, you will never ever feel dissatisfied. Utmost client satisfaction is what we always strive for at UK Dissertation Writers. ‘Contact Us‘ now to get a step closer to scoring high grades in your assessments.